WordPress is by far the most popular content management system (CMS), and for good reason. However, if you don’t like the interface, or resent having to constantly download plugins to achieve the functionality you want, you’re probably wondering if there’s an alternative CMS to better match your needs. We’ll discuss their respective strengths, explore what types of sites they’re best suited for, and talk about their pricing options. By the end of this article, you’ll be armed with the knowledge you need to make the right choice for your website development project. Let’s dive in! Joomla is an award-winning, open-source CMS. It features an extremely flexible interface, an intuitive menu-building system, and lots of powerful Search Engine Optimisation (SEO) tools. You can also broaden the functionality of your Joomla site with lots of extensions, which work in a similar fashion to WordPress plugins. Joomla is one of the more popular WordPress alternatives, and it’s easy to see why. The platform gives you a great deal of control over content workflows and template layouts, which dictate the appearance of your Joomla site in a similar fashion to WordPress themes. Another popular feature of Joomla is its built-in Access Control List (ACL), which makes site administration and granting contributor access an easy process. Includes a powerful PHP application-building framework. Offers a built-in cache management feature, which can boost your Joomla site’s speed and performance. Has 15 custom field types, letting you rapidly create specific kinds of content for your site. Provides extremely tight core security. This CMS is completely free, although you may need to purchase some premium extensions. Joomla is ideal if you’re looking to build a large-scale or complex site, without the need to do any excessive coding. The default platform has a slight edge on WordPress when it comes to group administration and development. For instance, there’s even a dedicated messenger function to enhance collaboration. If you are interested in setting up a Joomla website, check out our Joomla tutorial. Ghost is another popular open-source CMS, geared more towards creating stylish blogs or online publications (as opposed to complex websites). It comes with versatile features for customizing page layouts, scheduling posts, injecting analytics code, and more – all from one streamlined interface. Ghost also makes it easy to optimize and produce content on multiple distribution channels (maximizing your readership in the process). Another major perk of Ghost is that the platform is extremely developer-friendly. In addition to letting you enjoy complete control over API integration and theme development, Ghost has an automatic content backup system (so you won’t need to worry about your content disappearing in the event of an outage or crash). Includes subscription management and RSS feed integration features. Uses Markdown, an advanced plain text formatting syntax that converts content into well-structured HTML. Offers simple user-administration tools for assigning roles and permissions. Provides integrated AMP support, for quicker mobile loading times and better search rankings. Plans for Ghost range from the basic Personal option (catering to one blog for $19) to the Business plan (which includes up to 50 sites for $199). If you value a powerful but minimalist interface for creating content and don’t want to worry about burdening your site with plugins, Ghost is an alternative to WordPress that’s worth considering. It’s also ideal if you’re looking for a powerful but simple blogging CMS, with plenty of built-in SEO features. Despite being among the more lightweight WordPress alternatives on this list, Textpattern is still a solid option. Built using a simple yet robust tag-based template language, Textpattern offers a huge variety of ways to structure your content. The interface is beginner-friendly, and the platform is well supported with thorough documentation. Like WordPress, Textpattern can be easily extended with the use of plugins, which are regularly updated by contributors. There are also a variety of front- and back-end themes available to choose from, all of which can be easily tweaked to meet your specific requirements. Provides a wide selection of free platform modifications, themes, and plugins. Incorporates streamlined comment management and visitor log features. Has customizable subscription features, enabling your site’s visitors to tailor a content feed according to their preferences. Despite being one of the more powerful, well-supported, and versatile WordPress alternatives, Textpattern is completely free. Whether you’re a developer looking for a simple platform for HTML and CSS coding, or just a blogger who wants something a little less cluttered than the default WordPress interface, Textpattern is worth considering. It’s also a great solution if you’re looking for a platform you can master quickly, as it’s supported by a comprehensive tutorial. Unlike many other WordPress alternatives, Tiki Wiki focuses less on third-party extensions, and more on maintaining a heavy-duty set of core features. Due to this focus on a powerful, easy-to-update core framework, Tiki Wiki is perfect for collaborative projects, or sites with a strong social networking component. Tiki Wiki is easy to install, extremely well documented, and supported by one of the largest open-source teams in the world. The platform is also highly secure and is built using the most reliable underlying technologies (including MySQL and Bootstrap). These features make Tiki Wiki a solid choice for any web developer. Uses a single streamlined interface for generating a variety of content types (ranging from wiki pages and event calendars to online polls and quizzes). Offers a handy database tracking system, which is ideal for generating reports and detecting bugs. Provides a huge array of content-editing and administrative features. Includes membership management and payment facilitation features. Tiki Wiki can be counted alongside the most reliable free and open-source WordPress alternatives. If you’re looking for an easy-to-administrate CMS platform for a collaborative project or an e-learning site, Tiki Wiki could prove ideal. Although it doesn’t offer as many appearance-focused customization options as WordPress, it does eliminate the possibility of plugin compatibility issues. WebsiteBaker is a great CMS solution for developers and designers. Its simple interface makes it easy to build custom layout templates, using XHTML, CSS, and jQuery. There’s also a built-in What You See Is What You Get (WYSIWYG) editor, helping you instantly see how your coding changes will display on your site. The functionality of WebsiteBaker can be extended via downloadable modules. There are modules for adding image galleries, subscription forms, event calendars, and more. You’re also given the option to edit the modules you download, using a variety of admin tools. Plus, WebsiteBaker offers a number of downloadable templates for styling your site. Offers a portable version, enabling developers to create a stable local test environment with just one click. Includes a streamlined file management system, which enables you to batch-upload files to your site. Incorporates secure user-management and administration systems. Although WebsiteBaker is among the free WordPress alternatives, users are given the option to donate to the platform. Although not as feature-heavy as WordPress, the default WebsiteBaker platform has a slight advantage in terms of speed. Also, WebsiteBaker’s revolutionary ‘droplet’ system– a method for adding PHP code to any area of your site– presents a more flexible option than that afforded by the WordPress core platform. What distinguishes Jekyll as one of the more viable alternatives to WordPress is its simplicity. It exchanges the need for plugins, themes, and database management with a basic terminal window interface. However, if you’re not keen on excessive coding, Jekyll may not be the alternative to WordPress you’re looking for. Jekyll is a static-site generator, which lets you create your content as text files that can then be inserted into folders. Once your files are created, Jekyll enables you to build the shell of your site using the Liquid template language. Jekyll stitches your content with the shell, creating a static site that can be readily uploaded to all server types. Provides excellent blog migration capabilities. Includes a variety of template options. Offers a quick-start guide to help you master the basics of the platform. Jekyll is ideal for rapidly generating a fast, secure, and scalable site, without the need to spend time downloading add-ons from third-party providers. However, it isn’t as intuitive as many other WordPress alternatives. This versatile CMS ranks highly among WordPress alternatives, as it offers a lot of design freedom coupled with a very extensible framework. Built with the Smarty template system, CMS Made Simple is also extremely developer-friendly, making it easy to create custom modules for just about any kind of site. In addition to having a streamlined drag-and-drop interface, CMS Made Simple makes dividing up and administrating tasks a straightforward procedure. This platform differentiates itself significantly from WordPress, in that its database templates permit developers greater control over the appearance of website layouts (with no plugins required). Offers plenty of modules and plugins to extend functionality. Permits customization of your websites via shortcodes. Is extremely well documented and developer-friendly. CMS Made Simple is a free platform. If you’re searching for an expandable and flexible CMS, this option should make your shortlist. It offers many of the same advantages as WordPress, plus more tools for developers to take advantage of. As far as WordPress alternatives for casual blogging go, Serendipity is a major contender. Completely PHP-powered and open source, Serendipity offers dynamic caching for faster page generation, reliable anti-spam features, and a user-friendly interface. It’s also highly scalable, and able to accommodate multiple blogs. Like WordPress, Serendipity’s functionality can be extended with a series of plugins. However, unlike WordPress, it has separate categories for front-end and back-end plugins, enabling developers to filter their plugin searches more effectively. Themes are also categorized in this manner. Offers an extensive range of themes and plugins. Includes advanced entry cataloging and tagging features. Can be configured to use a single code base for multiple blogs. If you’re looking for a lightweight blogging platform with reliable support, a broad scope of functionality, and plenty of extensions, Serendipity should make your list. Although the interface of Grav is quite similar to WordPress, it differs in several ways. It features a powerful API that maximizes and simplifies development flexibility, for example, and includes an intelligent caching system to deliver high performance. Grav also features advanced forms that let you configure the appearance of your content effortlessly, and define custom fields for all pages of your site. Plus, there’s a robust markdown editor, as well as a streamlined ‘package-manager’ that lets you search for and download plugins with ease. Includes advanced media processing and image editing capabilities. Offers powerful content filtering features, including the ability to create as many taxonomies, tags, and categories as you wish. Provides a reliable and user-friendly site backup and restoration feature. Grav is a free and open-source CMS. 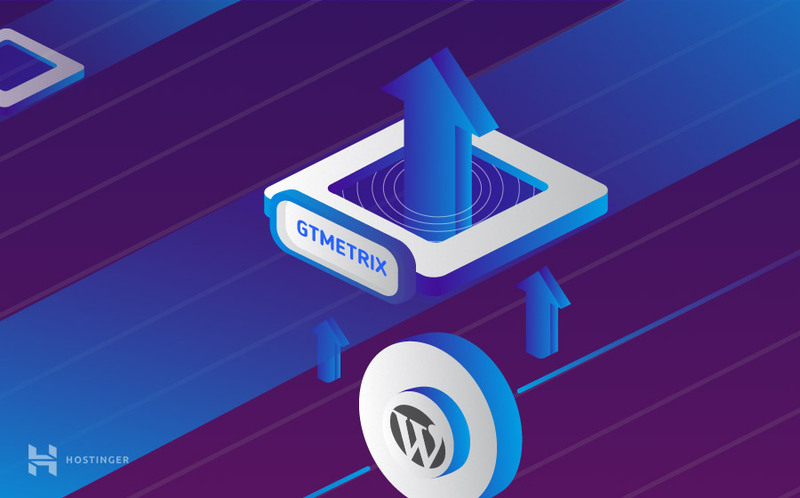 Grav ranks among the most acclaimed open-source WordPress alternatives and has been recognized with a number of awards and accolades. If you’re looking for a CMS that has a similar feel to WordPress but is based on flat-files, Grav is an excellent solution. Craft CMS is a feature-rich, open-source platform. In addition to offering a sleek interface for building HTML and creating content APIs, Craft CMS enables you to preview all changes made to your site in real time. Craft CMS also lets you run and manage multiple sites from a single installation and has built-in localization features for simple site translation. One thing that makes Craft CMS one of the best WordPress alternatives is its Matrix field type generator. This system lets you divide up posts into multiple blocks (small content pieces) that can be defined and ordered for a neat presentation. Many users find this a more streamlined method than adding images into a basic text editor. Offers a streamlined asset management system, which lets you store your files in the cloud and upload them as needed. Includes a library of plugins for extending functionality. Has a robust relationship engine, enabling you to link together assets, tags, and categories efficiently. The free version of Craft CMS is suitable for small-scale personal sites, while the pro version is available for $299 (plus $59 per year for updates). Craft CMS permits a broad scope of freedom for front-end customization. It’s also a solid option to consider if you’re looking for an interface that makes it easy to structure content consistently. Statamic makes a point of showcasing how it differs from WordPress upfront. Its key point of difference is that it does not make use of databases, instead storing everything in local files. Statamic is also built using the cutting-edge PHP framework Laravel, eliminating some security issues that WordPress is vulnerable to. Although Statamic runs on your server, it is a great CMS for collaborative projects. The control panel function makes content uploading and categorizing easy to manage. Includes a wide variety of functionality add-ons and theme options. Incorporates a built-in function for managing unlimited forms. A Statamic license can be purchased for $199 per website, which includes three months of direct support. Statamic is a stand-out alternative to WordPress, particularly in terms of flexibility and security. If you value keeping your files local, it’s a first-rate choice. ExpressionEngine is ideal if you’re a developer looking for WordPress alternatives that offer greater workflow streamlining for complex sites. This CMS also lets you tailor specific kinds of content with multiple channels and custom content fields, making it a stand-out choice if you value flexibility. What’s more, ExpressionEngine helps you manage your content effortlessly on mobile and tablet devices. It’s also highly-extensible, with an architecture geared towards rapid troubleshooting. Includes plenty of default SEO tools. Has some versatile community-building and permission-management features. Although there is a feature-limited free version, the full version of the CMS can be purchased for $299. Add-ons and additional support packages can be bought separately. If you’re dissatisfied with the options WordPress offers for managing work processes, or the relationships between content, ExpressionEngine is worth exploring. As far as responsive, extensible, and customizable WordPress alternatives go, Subrion is an outstanding solution. Unlike WordPress, Subrion comes with excellent SEO features and debugging tools out of the box. Like WordPress, it is free and open source. It’s easy to customize the look and functionality of your Subrion site via templates and plugins. On the back end, Subrion includes an intuitive administration panel that lets you track user activity in real time. Includes a wide variety of customizable fields. Offers built-in payment systems for monetizing your website (with no plugins required). Has a powerful drag-and-drop content creation interface. Subrion is free, although there are a few premium templates and plugins available for purchase. Subrion is powerful enough to create sites for just about any application, from a personal blog to an e-learning profile or online store. If you’re searching for an alternative that still retains a WordPress feel, but has a few additional features bundled in, Subrion is definitely worth a try. Shopify is an e-commerce focused CMS that makes it easy to sell products across multiple sales channels. In addition to letting you easily create the look and feel of your site, Shopify can serve as an excellent Point Of Sale (POS) solution. It also integrates with a range of shipping apps for automating your order fulfillment processes. If you aren’t keen on the idea of relying on plugins like WooCommerce to build an online store, or you want to work with an interface geared solely for commerce, Shopify is a worthwhile solution. Incorporates an excellent range of cash flow management and payment gateway options. Offers a sizable catalog of free business tools. The standard plan for Shopify is Basic, which offers essential tools for new businesses at $29 per month. The Shopify plan ($79 per month) contains additional features for facilitating business growth. Finally, Advanced Shopify ($299) is the most feature-heavy option and can accommodate up to 15 accounts. Shopify is ideal if you’re looking to launch your online store quickly and manage it with a minimum amount of fuss. However, compared to WordPress, it is quite pricey, as you can use WooCommerce and create a store for free. 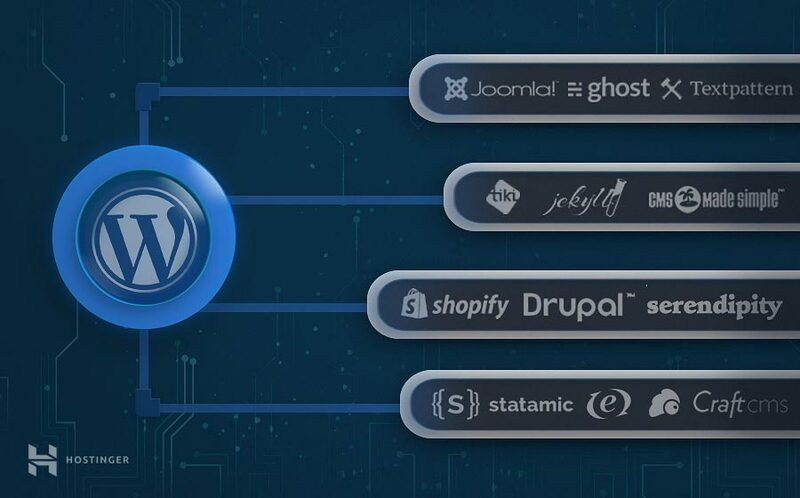 Finally, Drupal is a popular WordPress alternative among developers looking to build large-scale, complex sites (particularly those that have to manage lots of client data). Drupal is fast-loading, well-supported, secure, and it offers virtually limitless customization options. Although it could be argued that Drupal is less beginner-friendly than WordPress, it does have an advantage in terms of kickstarting industry-specific sites. For example, Drupal offers prepackaged solutions for non-profit companies, the healthcare sector, government departments, university sites, and more. Includes a huge variety of custom field types, modules, templates, and other site-building elements. Incorporates versatile project development environment capabilities. Offers a large number of themes and functionality-extending modules. Drupal is a free and open-source CMS. Combining a strong infrastructure with lots of flexibility, Drupal is well suited for marketers, developers, and creative professionals alike. Although the learning curve is steeper than it is with WordPress, this platform more than makes up for that in terms of performance and scalability. Find out more about this CMS on our Drupal tutorial. Choosing the CMS to start a blog or a website development project is a big decision, particularly if you aren’t going with WordPress. You’ll need to meticulously research different interface options, what add-ons and extensions are offered, coding capabilities, and layout templates. However, as we have seen, there are plenty of WordPress alternatives out there to try before you make your final decision. If you have any questions about these alternatives for WordPress, or how Hostinger can provide support for your chosen CMS, let us know in the comments section below!